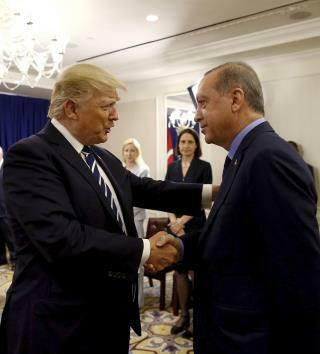 (Newser) – Turkey and the Palestinians warned on Tuesday of dire diplomatic repercussions if President Trump goes ahead with a possible recognition of Jerusalem as Israel's capital. Turkish President Recep Tayyip Erdogan told parliament that his country's response "could go as far as us cutting diplomatic ties with Israel," reports the AP. A senior aide to Palestinian President Mahmoud Abbas warned that the Palestinian leadership could halt contacts with US counterparts in response to such recognition. American officials have said Trump may recognize Jerusalem as Israel's capital this week as a way to offset his likely decision to delay his campaign promise of moving the US Embassy. The White House missed a deadline Monday to waive a law requiring the US Embassy be moved to Jerusalem, reports the Guardian; the waiver is required every six months, and Trump signed it in June. Trump's point man on the Middle East, son-in-law Jared Kushner, later said the president hasn't decided yet what steps to take on Jerusalem. The possibility of such recognition triggered mounting criticism and opposition by Muslim and Arab states. The Arab League was to meet Tuesday, while on Monday, the Organization of Islamic Cooperation said US recognition of Jerusalem as Israel's capital would constitute "naked aggression." Majdi Khaldi, Abbas' diplomatic adviser, said recognition of Jerusalem as Israel's capital could destroy Washington's role as mediator between Israelis and Palestinians. Recognition "would mean they decided, on their own, to distance themselves from efforts to make peace and that they will have no credibility or role in this issue," Khaldi told the AP. "We will stop our contacts with them [in the event of recognition] because such a step goes against our existence and against the fate of our cause." THEY DESTROYED PALESTINE !!!! THEY TERRORIZED THE PALESTINIANS BY MASSACRES THAT DROVE OUT THE DEFENSELESS PALESTINIANS, MY WIFE AND HER FAMILY WAS ONE OF THERE VICTIMS`, I MET HER ON A TRIP TO SEE MY HOMELAND WHERE I WAS BORN IN 1935, I WAS IN THE US ARMY SERVING IN GERMANY AND MADE THE TRIP TO SEE MY YOUNGEST UNCLE IN PALESTINE WHEN WE MET,FOR OVER 20 YEARS SHE WOULD WAKE UP SCREAMING THE JEWS WHERE TRYING TO KILL HER!!!!!!!!!!!!!!! !BUY A GUN JOIN THE NRA KEEP OUR BELOVED AMERICA FREE !!!!!!!!! I DECEND FROM THE FIRST CHRISTIANS IN THE WORLD MY FAMILY WAS THERE IN PALESTINE WHEN JESUS CAME TO PALESTINE !!!!!!!!! !WHY ARE ALL THE JEWS IN AMERICA TRYING TO DISARM AMERICANS BLOOMBURG ETC ETC ETC WHY ??????????????????? ?